So I’ve chosen to show you two chunkies – one hand knit pattern and one for the chunky/bulky machine. Plus as a bonus I’ve included a little video showing how I do a ‘no-roll’ edge for machine knitters. It works especially well for chunky yarns. The Pebbles Jacket is hand knitted in Hayfield Bonus Chunky in a grey fleck. It’s knitted in garter stitch with added detail in mock cable around the waist and the cuffs. This is an interesting stitch to learn and I’ve used it a lot…very effective and feminine. Although there are no front fastenings for this jacket, they could be easily added. 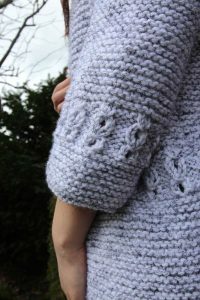 So if you fancy snuggling up in this one then here’s the link to the pattern which comes in sizes XS to XXL…click here. For machine knitters who have a chunky machine I designed this knitting pattern for the Sugar & Spice Jacket. The plain half was knitted in a chunky cream boucle yarn. For the colourful half I used James C. Brett Marble in chunky. 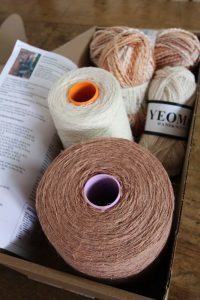 Gorgeous colour combinations in this yarn! You’ll notice that I have knitted the edging to both halves in the James Brett yarn. This was done using my new ‘no roll’ edge technique. 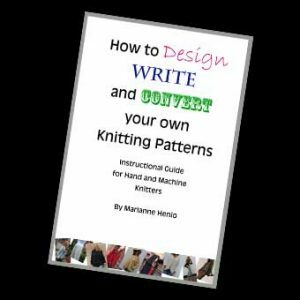 If you ever got to read my article in Machine Knitting Monthly about this you will know how I came across this method! So if you fancy a go at knitting the Sugar & Spice Jacket here’s the link…click here. Wow! Thanks. I can definitely use this techniques on my chunky machine. Very nice. I will definitely try this out.Thank you for sharing..